Born April 8, 1938 on Mount Moriah, Tennessee; passed away November 7, 2014 in Citrus Heights, CA at the age of 76. Beloved husband of 55 years to Reva Jean Scherffius. 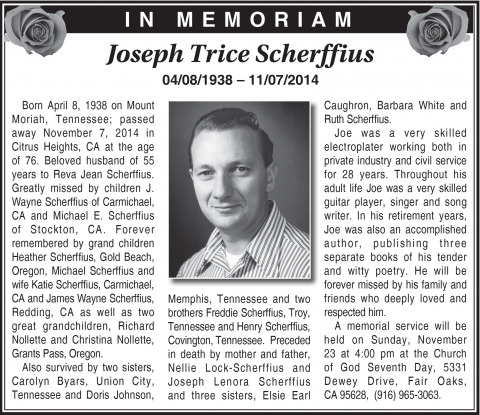 Greatly missed by children J. Wayne Scherffius of Carmichael, CA and Michael E. Scherffius of Stockton, CA. Forever remembered by grand children Heather Scherffius, Gold Beach, Oregon, Michael Scherffius and wife Katie Scherffius, Carmichael, CA and James Wayne Scherffius, Redding, CA as well as two great grandchildren, Richard Nollette and Christina Nollette, Grants Pass, Oregon. Also survived by two sisters, Carolyn Byars, Union City, Tennessee and Doris Johnson, Memphis, Tennessee and two brothers Freddie Scherffius, Troy, Tennessee and Henry Scherffius, Covington, Tennessee. Preceded in death by mother and father, Nellie Lock-Scherffius and Joseph Lenora Scherffius and three sisters, Elsie Earl Caughron, Barbara White and Ruth Scherffius. Joe was a very skilled electroplater working both in private industry and civil service for 28 years. Throughout his adult life Joe was a very skilled guitar player, singer and song writer. In his retirement years, Joe was also an accomplished author, publishing three separate books of his tender and witty poetry. He will be forever missed by his family and friends who deeply loved and respected him. A memorial service will be held on Sunday, November 23 at 4:00 pm at the Church of God Seventh Day, 5331 Dewey Drive, Fair Oaks, CA 95628, (916) 965-3063.